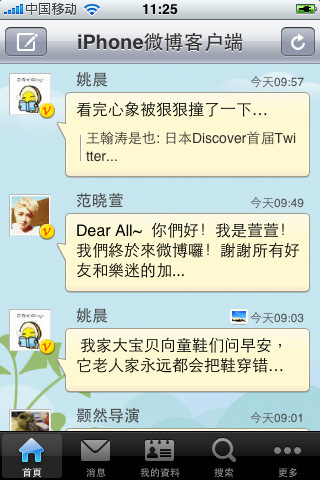 Sina Weibo, an informal mini-blog product, is a new expression to Web2.0. Sina Weibo for Mobile is a latest Internet service that publishes information instantly. It is also recognized as the user-active communication media. Weibo, innovated by Sina Corporation (NASDAQ: SINA), is the new inter-active application that will be widely used, fast spread and it surely will be distinguished to the world. Qweas is providing links to Sina Weibo for Mobile 1.1.0 as a courtesy, and makes no representations regarding Sina Weibo for Mobile or any other applications or any information related thereto. Any questions, complaints or claims regarding this application Sina Weibo for Mobile 1.1.0 must be directed to the appropriate software vendor. You may click the publisher link of Sina Weibo for Mobile on the top of this page to get more details about the vendor.